Who needs roses and wooing when you have the best friends in the world? Oftentimes the best pleasure is being known and recognized for who you are, your company sought out despite your flaws and friends do that all the time. Grumpy days. Excited days. They are there when you need them and that love can never be replaced. 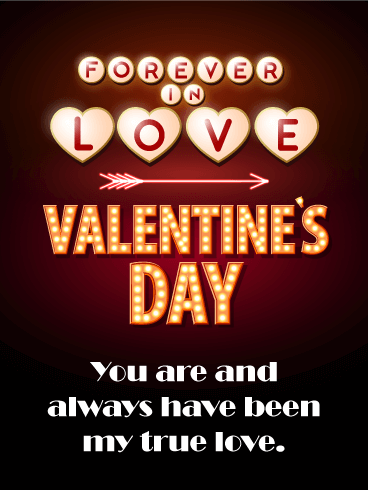 Tell your friend how fabulous she is for sticking with you and wish her a spectacular Valentine's Day full of love. 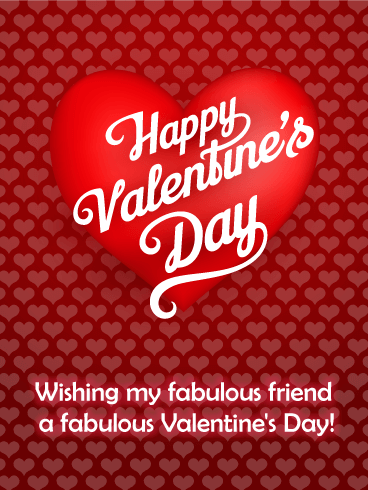 Happy Valentine's Day - Wishing my fabulous friend a fabulous Valentine's Day! The is nothing purer than the love of friends, those silly ladies who stay with you through thick and thin because they enjoy your company. They've been with you when you gush about a Valentine's date or revel in the joys of being single in February. 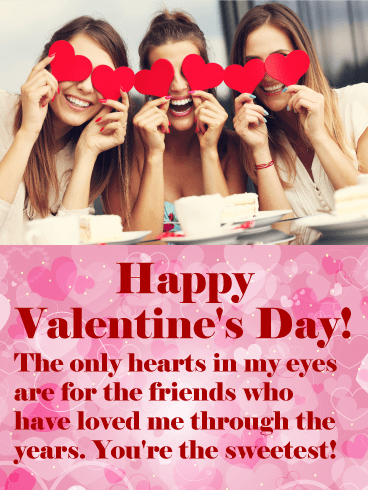 Either way, friends love you through all the troubles and it's only right to wish your friend a happy valentine's day because of the deep friendship between you. Before you knew about boys, you knew the bond of friendship. The pinkie promises and lunch table saves. The celebrity crushes came later, but you went through those times together too. Sweet and sour, your friendship started long ago and there's no end in sight. 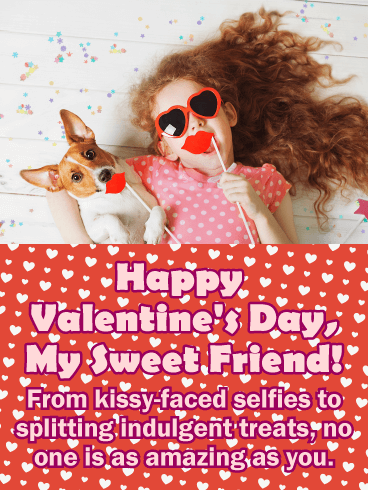 Wish your friend a continuation of all that's good in the world this Valentine's Day - laughter, sweet treats, and the bond between the two of you. The highlights of our lives are the bright, shining moments we spend with our loved ones. Spouses, parents, kids. Many involve family but so much of ourselves, of our glowing memories, belong to the friends who warm our hearts and share their love. 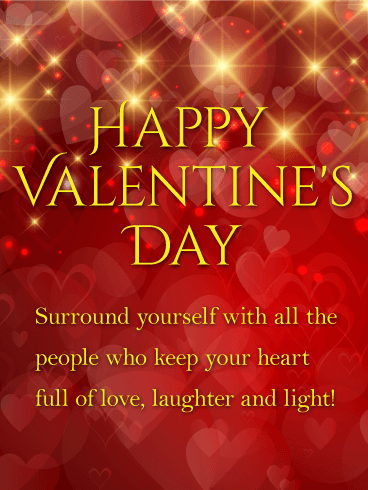 Share the warmth of friendship this Valentine's Day and wish your friend peace and happiness this year. Friends deserved to be celebrated. No one can resist yummy chocolates, especial on Valentine's Day. 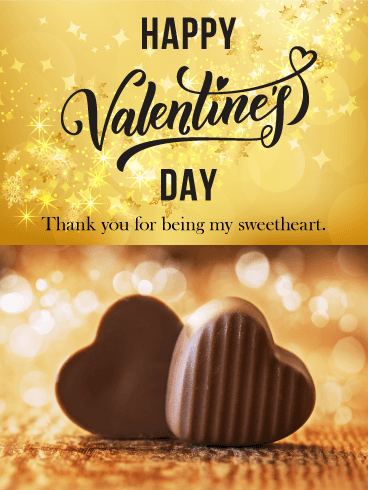 This great Valentine's Day card has it all, rich chocolate hearts, golden sparkles, and an endearing message. It's perfect! 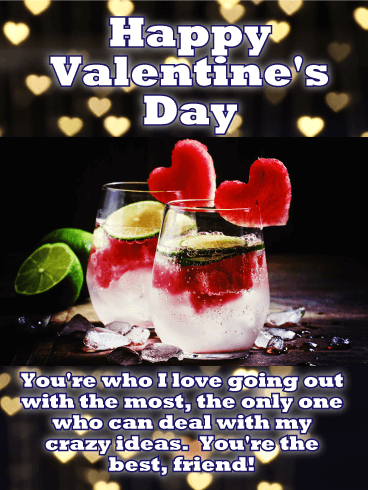 Wish your sweetheart a Happy Valentine's Day with this awesome Valentine's Day card, it will certainly make them feel special. 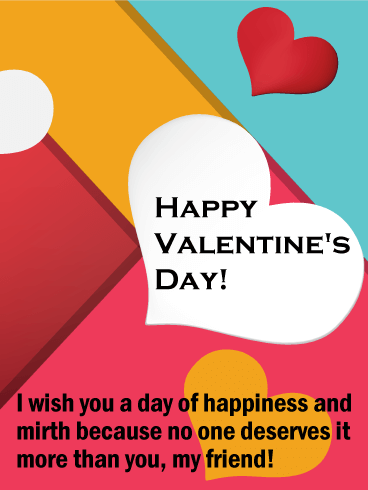 This February 14th is the day to show you care with a terrific Valentine's Day card such as this one! From hugs to baskets of goodies, no one treats you as kindly as your friend. Bonded by silly interests and crazy adventures, friendship is a pure feeling that nothing can compare to. Joy and laughter, anger and tears. Together you've been through it all and the sisterly love between you is strong. Celebrate it this Valentine's Day and wish your friend love galore. 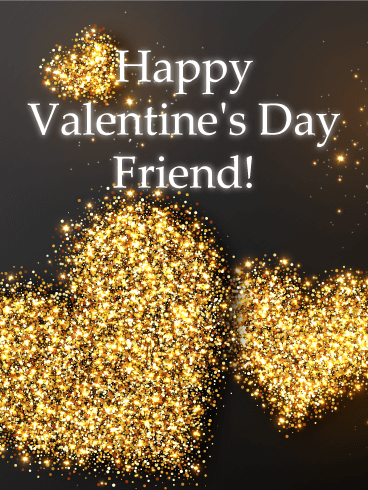 Wish your friend a happy Valentine's Day! She may not be the light of your life, but she still makes it brighter. Pushes away your February blues to bring the light of June sunshine. 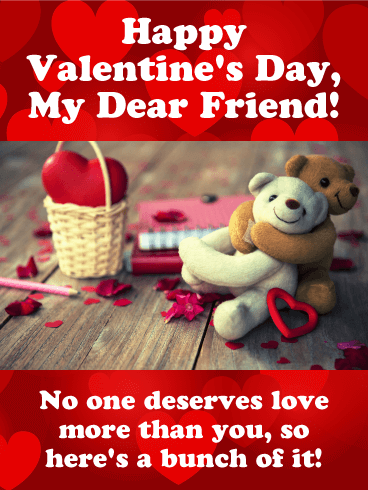 Life would be dull and grey without her colorful personality and Valentine’s Day is the perfect time to tell her you love her and just how much your friendship means to you. Instead of making eyes at the guys around town, revel in the love between friends this year. Your relationship is nothing like what you might have with Fabio, but it's all the better for it. You have known each other longer, better. Offer support and advice, tissues and chocolate. Platonic love is just as strong as it's romantic cousin, and just as deserving of celebration. 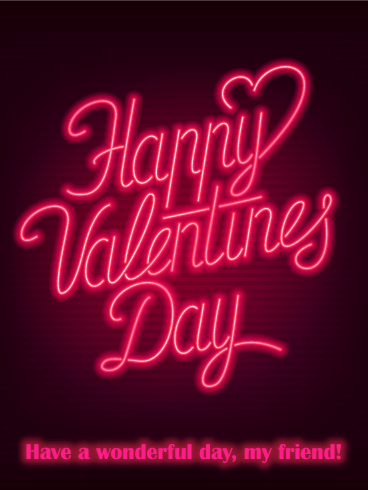 Wish your friend a fabulous night this Valentine's Day and spend it together. Neon lights make everything more special, especially when it is an expression of love. The creative elements in this Valentine's Day card will show your Valentine that you care enough to send the best! 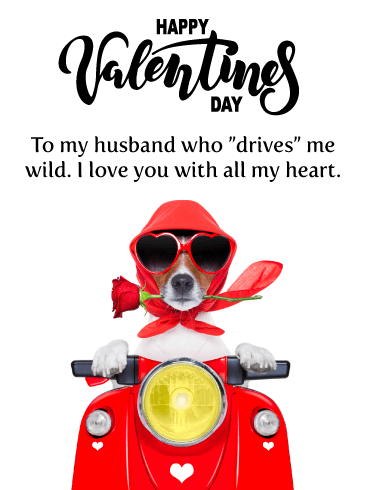 This Valentine's Day greeting card will also let your special someone know that they are your true love and always have been. So sweet! Send this awesome Valentine's Day card out so your loved one can start February 14th out with a smile! From steamy kisses to teary breakups, your friends have always been involved in your Valentine's Day adventures. Kind, companionate, with warm hearts bursting with love, friends are the best people in the world. 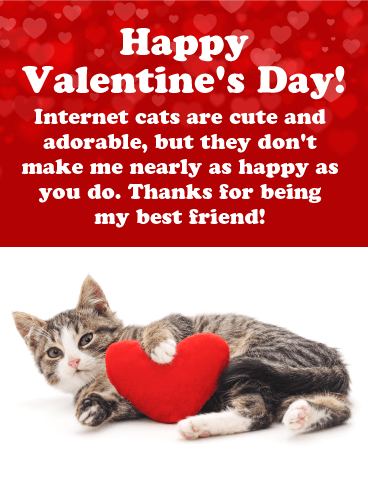 Share the love with your girl friends this year with the help of an adorable kitten and let them know they're surrounded by love from all sides. The bzzt of attraction was a result of the smallest thing. But now you're lunchtime buddies and hour-long-phone-call gals. You went from strangers to near besties, and there's no one who shares your level of love for that one Netflix show. Your friendship is wonderful, and love between you strong. So wish your friend a beautiful day that sizzles with romance, so you can talk about it on the phone tomorrow.